At the US Academy of Parachute Rigging, we offer extensive professional parachute rigger training courses to individuals as well as civilian and military organizations worldwide. To provide world-class curriculum, instructors and facilities for training professional parachute riggers. To provide for the continued safety of parachute users worldwide through education and training. To support the international parachute industry by providing a continuous source of trained personnel. To provide for professionalism by Parachute Riggers. 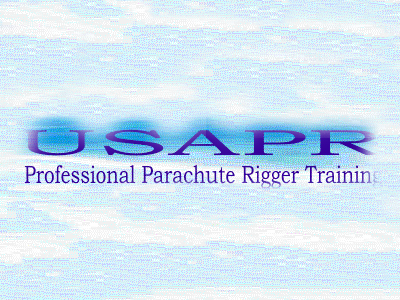 The USAPR is the first civilian training facility in the world to offer full-time staff and facilities for professional parachute rigger training. The 3000 sq. ft. facility includes dedicated class room and study areas, four separate inspection and packing areas for both round and square parachutes, 14 dedicated sewing machines, 15 different back, 6 chest, and 4 seat pack parachutes for training and familiarization. The USAPR also has an extensive inventory of specialized tools, and a comprehensive library of parachute manuals and instructions. The USAPR is co-located with Rigging Innovations, a major harness and container manufacturing facility, and is adjacent to Skydive Arizona, one of the world’s largest skydiving centers. The Administrator is the first point of contact for information regarding course schedules, reservations and payment details.